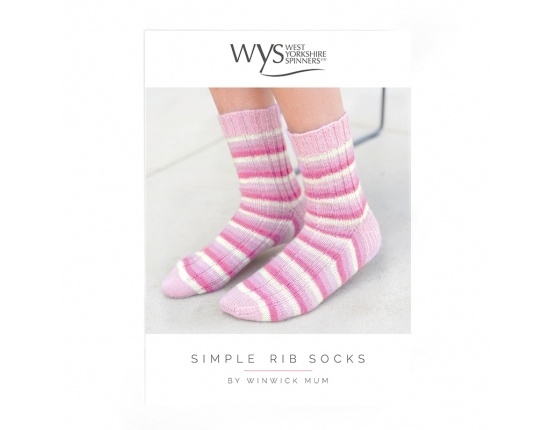 Simple Rib Sock Pattern by Winwick Mum<br> <br> Our Simple Rib Sock pattern designed by Winwick Mum is suitable for beginners. This pattern will show you how to make ribbed socks with a durable and cushioned heel. Create striking and cosy socks for both men and women.<br> <br> Please note, this pattern is for a medium sized sock approximately 8 inches however the length of the sock is easily adjusted for larger feet.<br> <br> This pattern uses 1 x ball of Candyfloss Signature 4Ply for the plain rib pattern alternatively to create the contrast heel and cuffs you will need 1 x ball of Pink Flamingo and 1x ball of Candyfloss.